The All photos page displays all JPG photos with a specified creation date. 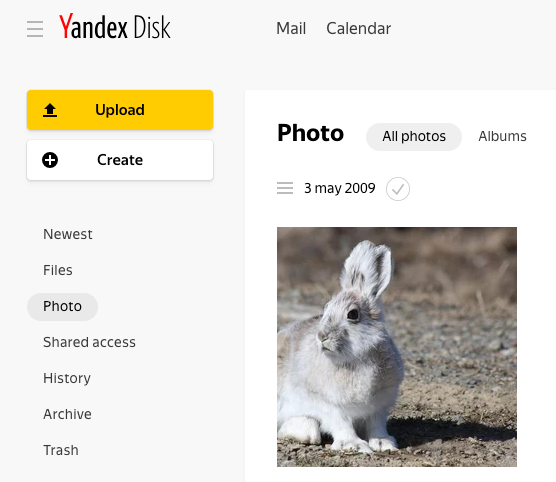 Photos that were automatically uploaded to Yandex.Disk from mobile devices can also be found in this section. Note. It isn't possible to manually add photos to this section because it is compiled automatically. If you want a photo to appear in this section, add the date it was taken to it. To go to the All photos page, choose the Photo → All photos tab in the left panel. You can share photos, add them to a private or public album, move, rename and edit them in the photo editor, or remove them from the Disk. To do this, point at the photo, click the icon in its lower left corner and choose the desired operation in the top panel. Note. Photos are not copied physically to the All photos section — they are only displayed in it. This means that if you delete a photo from this section, it will be deleted from your Disk. If you deleted a photo from this section by mistake, you can recover it. If you want to quickly find pictures for a certain month, click the icon above the photos and choose the creation date.